Germany's financial heartland, and much more. Frankfurt am Main is the largest city in the German state of Hessen and the fifth-largest city in Germany, with a 2014 population of 717,624 within its administrative boundaries. The urban area called Frankfurt Rhein-Main has a population of 2,221,910. The city is at the centre of the larger Frankfurt Rhine-Main Metropolitan Region which has a population of 5,500,000 and is Germany’s second-largest metropolitan region. Since the enlargement of the European Union in 2013, the geographic centre of the EU is about 40 km (25 mi) to the east. 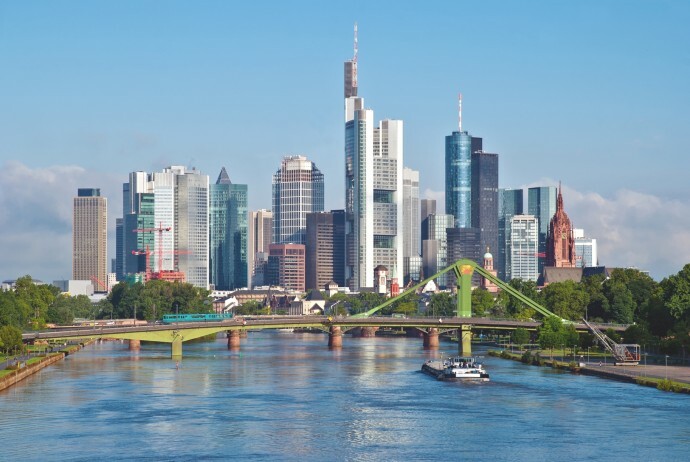 Frankfurt is a centre for commerce, culture, education, tourism and web traffic. Messe Frankfurt is one of the world’s largest trade fairs at 578,000 square metres and ten exhibition halls. Major trade fairs include the Frankfurt Motor Show, the world’s largest motor show, and the Frankfurt Book Fair, the world’s largest book fair. Frankfurt is home to many cultural and educational institutions, including the Johann Wolfgang Goethe University and Frankfurt University of Applied Sciences, many museums (e.g. Städel, Naturmuseum Senckenberg, Schirn Kunsthalle Frankfurt, Goethe House) and two major botanical gardens: the Palmengarten, which is Germany’s largest, and the Botanical Garden of Goethe University. In 2010 63 national and 152 international banks had their registered offices in Frankfurt, including Germany’s major banks, notably Deutsche Bank, Commerzbank, DZ Bank and KfW, as well as 41 representative offices of international banks. Frankfurt is considered a global city (alpha world city) as listed by the GaWC group’s 2012 inventory. Among global cities it was ranked 10th by the Global Power City Index 2011 and 11th by the Global City Competitiveness Index 2012. Among financial centres it was ranked 8th by the International Financial Centers Development Index 2013 and 9th by the Global Financial Centres Index 2013. Its central location within Germany and Europe makes Frankfurt a major air, rail and road transport hub. Frankfurt Airport is one of the world’s busiest international airports by passenger traffic and the main hub for Germany’s flag carrier Lufthansa. Frankfurt Central Station is one of the largest rail stations in Europe and the busiest junction operated by Deutsche Bahn, the German national railway company, with 342 trains a day to domestic and European destinations. Frankfurter Kreuz, the Autobahn interchange close to the airport, is the most heavily used interchange in the EU, used by 320,000 cars daily. In 2011 human-resource-consulting firm Mercer ranked Frankfurt as seventh in its annual ‘Quality of Living’ survey of cities around the world. According to The Economist cost-of-living survey, Frankfurt is Germany’s most expensive city and the world’s 10th most expensive. Frankfurt has many high-rise buildings in the city centre, forming the Frankfurt skyline. It is one of the few cities in the European Union to have such a skyline and because of it Germans sometimes refer to Frankfurt as “Mainhattan”, a portmanteau of the local Main River and Manhattan. Before World War II the city was globally noted for its unique old town with timber-framed buildings, the largest timber-framed old town in Europe. The Römer area was later rebuilt and is popular with visitors and for events such as Christmas markets. Other parts of the old town are to be reconstructed as part of the Dom-Römer Project by 2016. Arranging a private jet charter to and from Frankfurt (EDDF /FRA) is straightforward. Frankfurt lies approximately 13 kilometres from the city centre and takes around 25-30 minutes by car, subject to traffic. A private jet charter from London to frankfurt will take approximately 1 hour 15 minutes in a 6 seat Cessna Citation CJ2 jet, and 1hour 05 minutes in a 8 seat Cessna Citation XLS jet. Arranging a private jet charter or helicopter transfer with Freedom Air to arrive in style to Frankfurt is simple. The Freedom Air team can be reached on +44 (0) 1275 548001 to book your next trip.